Office environment stressors - Sitting Safely? A report, launched, in 2016, at the US Green Building Council’s Greenbuild conference, found that employees in high-performing, green-certified buildings had 26% higher cognitive function test scores than those in similarly high-performing buildings that were not green certified. Hitherto stress related illness has been thought to be due to psychogenic causes associated with changes in commercial practice. More recently it has been recognised that adverse indoor physical environmental factors actually account for the bulk of stressors in the office and work environment. 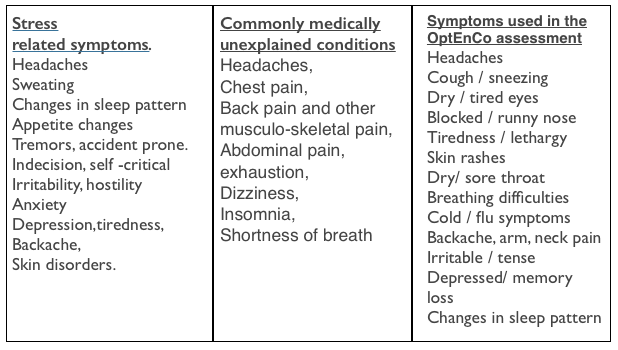 These potentiate the minor morbidity (illness) and the more overt psychosomatic expression. Environmental stressors can be identified, quantified and relatively easily corrected. When addressed up to 40% increase in productivity is permanently achieved. 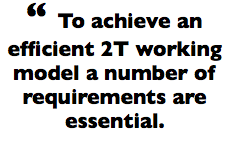 Secondly, illness and stress result in increased churn rates which carry extra costs to a firm for staff replacement. Thirdly, in the UK, there were 164,000 claims for stress-related conditions in 1999-2000, an increase of almost a third on the previous year. Litigation damages can be spectacular and in addition to these costs, media coverage of litigation results in damage to a firm’s reputation. It should also be remembered that under both HSE and pending EEC legislation management will have not only a civil but also a criminal liability. The pressures of recession are adding to the ethos of business management which has resulted in ‘downsizing’ of the workforce which creates extra demands on surviving staff and added to long hours spent in a physiologically unfriendly environment, gives rise to anxiety, fatigue and to high levels of morbidity and breakdown. A consideration of the medical background show that three broadly overlapping and ill-defined medical conditions have been described. The first ‘stress related’ illness is generally regarded as a psychological response to anxiety and fatigue leading to a number of symptoms and even serious breakdown and illness. The second is of more interest to doctors (not to mention their patients). As many as one in five new consultations in medical primary care fail to identify a recognised organic medical condition. These include chest, back and abdominal pain; exhaustion, headaches, dizziness, insomnia, shortness of breathe – to name only a few. Some prove to be transient; about 10-15% are shown to have an organic cause; some have an unrecognised organic cause – but most have symptoms that persist and are never explained in spite of appropriate investigation. A confusing terminology has developed around this poorly understood group. The most exact and nonjudgmental is ‘medically unexplained symptoms’ which many feel to be too unspecific. ‘Psychosomatic illness’ implies that psychogenic conditions results in a physical illness and ‘somatisation’ suggests a psychogenic condition which is expressed in physical symptoms. Some patients may have overt psychiatric disorders such as anxiety, depression or a phobic personality. Most have a complex mix of etiological factors , biological, psychological, social and cultural. The third, consisting of symptomatology associated with the environmental physiological stressors, may be the most important and is usually ignored. 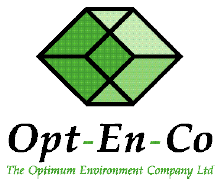 In the last five years a simple standardised assessment has been developed for symptoms and environmental satisfaction and been related to a number of adverse parameters in the physical environment by OptEnCo in conjunction with Reading, University3 . A baseline normal has been established and it has found for 30,000 office workers in 300 buildings in the UK, USA and Europe that 80% of these workers experience excessive symptoms due to various physical stressors in the office environment4 . The top (worst) score is 20 and this can be permanently reduced to 2-0 if environmental stressors are eliminated. An average unimproved modern office environment scores about 6 and a score of 12 shows a definite negative environmental impact on staff. The common factors are a mix of adverse or threatening environmental condition which result in stimulation of neurohumeral mechanisms mediated through the hypothalamic-pituitary-adrenal axis which result in a widespread physiological response. 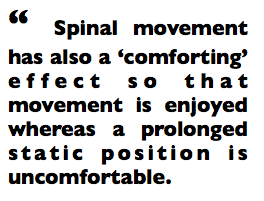 Stressors initiates a neuro-humeral cascade which finally affects the whole body. In the acute phase threatening environmental stressors result in the ’fright, flight, fight’ response. In evolutionary terms these are an important survival mechanism. In modern office conditions they can be the reverse. Stressors , in addition to excess temperature and humidity variations and ergonomically incorrect furniture, include less obvious environmental components. Office equipment generate saw-tooth sounds which in nature are used by animals as aggressive warning signals and square wave sounds which are used for identification. Both cause alarm and are likely to be stressors in humans. At high and prolonged level, noise is rare in nature but poor acoustics in an office leads to raised voices, distraction and increased measurable levels of stress hormones. Lighting by ordinary fluorescent tubes may appear white, but actually only emit light mainly in a narrow band at the yellow end of the spectrum. Only some 8% of the photo-receptors in the retina are stimulated (as compared to 79% in daylight). Added to this, and because of the ‘omni-directional’ nature of the light, some 25% of the light is lost as ‘glare’ – that is, light striking the eye directly and containing no visual information. A 52 cycle ‘flicker’ (in UK) is caused by the conventional ballast of fluorescent tubes. Refresh rate is detected by the eye although not registered by the conscious mind. In addition this rate interacts with that of the VDU screen (at 60-70 cps). This produces an even more deleterious flicker effect. 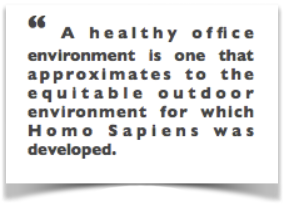 Micro-climatic conditions in most offices are equivalent to the stressful conditions that occur before a thunderstorm or during prolonged desert winds due to the positive ionisation caused by electrical and electromagnetic (EMF) emissions from the multiplicity of machines in the modern office. Chemical and particulate pollutants are potentially pathogenic, and are therefore stressors. These are in low concentration in nature and easily dispersed by air currents or denatured by ultra violet light. 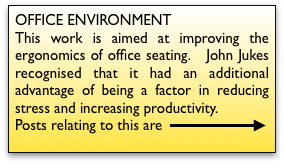 The high levels found in industrial society are even higher in an enclosed office space where some are being produced. Toxic Volatile Organic Compounds (VOCs) are produced by new carpets and furniture. Viruses, bacteria, moulds and their spores are provided with ideal culture habitats and also dispersal systems through inadequate air conditioning. Microparticles. Computers and in particular CRTs create microparticles of carbon derived from incinerated shed squame skin cells. These can penetrate the lining epithelium of the lungs and blood vessels and are thought to have an effect on the autoimmune system. This entry was posted in OFFICE ENVIRONMENT on February 5, 2016 by Dr. Henry Sanford. This work is not commercial. It is only intended to be of help. Any apparent advertisments were posted free of charge and may be useful. Some are included for an alternative view or just a laugh.